The disappointment of missing the Broadway performance of ‘Matilda the Musical’ due to a myriad of flight delays the day before was soon abated as we set out to explore the city. Now Princess had an ACL replacement surgery on her knee just two months before. I wasn’t sure how able she would be to explore on foot. She was determined to get by without her crutches. So I made reservations for us to take a full day tour of the city on a bus. We got up early and had a quick breakfast in a deli across the street from our hotel. Then we made our way to the tour bus depot, climbed a board and set off on our adventure with a bus load of comrades…..and a tour guide with a very thick accent. Lucky me with my hearing loss. The tour was very visual and that was nice. Even if I couldn’t understand a word the tour guide was saying. He must have been funny as people were laughing. The first stop was at Grant’s Tomb and we disembarked, looked around and boarded the bus again. Princess was hiding under her hat and sneaking in a good little nap. I nudged as we passed things that were familiar…at least to me. Central Park. The Lincoln statue on the steps of the historical museum. She perked up as the bus made it’s way through Harlem and passed the Apollo Theater. She had used several pictures of it for a power point project the year before. Kinda cool to see it in person…even though it was just a drive by. The bus stopped in Little Italy where we were taken to the basement dining room of a small restaurant called ‘The Grotto’ and given a choice of four luncheon selections. It was charming and tasty…..and had a bathroom. After lunch we had time to wander the neighborhood a bit and it was a bit disappointing as most of the shops were closed. She was intrigued with a shop window that touted vintage clothing….and a cat. We did step into a little bakery the tour guide recommended and shared a piece of truly awesome New York Cheesecake. 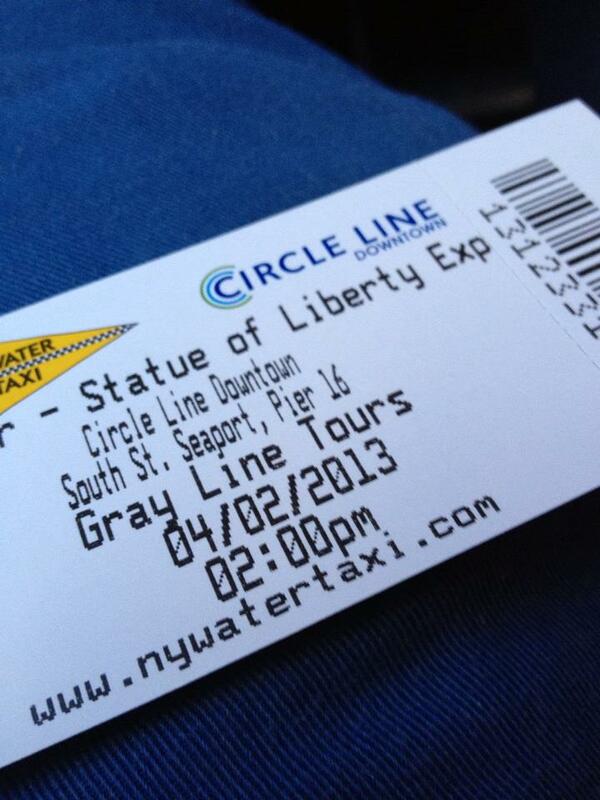 Then it was back on the bus for a short jaunt to the harbor area and a water taxi. Princess was in Kindergarten when the towers fell. She learned to count with the flags that appeared everywhere in our little community that fall. There were nearly 300 of them on our drive to school. 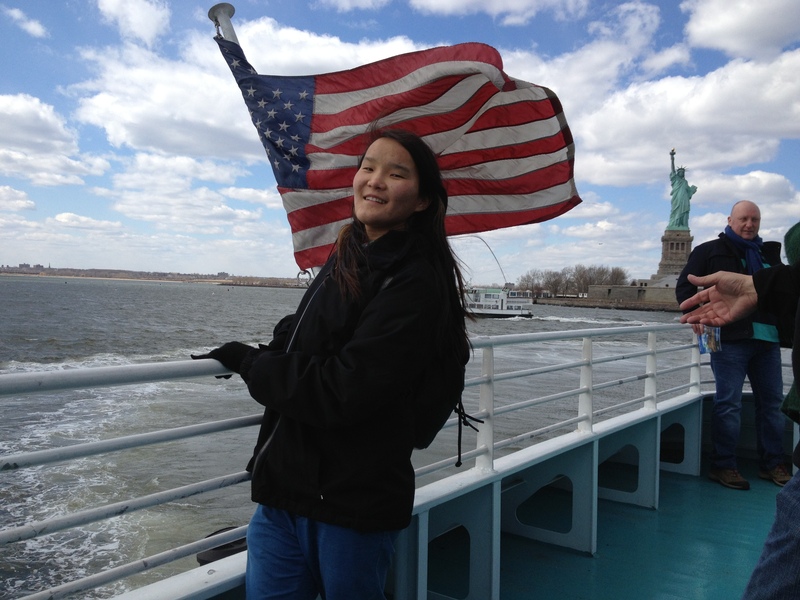 She was a sophomore in high school when we realized she would want – and need – that official citizenship document. Americana symbols have always been important to her but she has always – ALWAYS – had a particular a fascination for the Statue of Liberty. In fact, it was the one thing she asked me to bring back for her on my first trip to New York – ‘something with the Statue on it.’ (I found a Statue of Liberty M&M dispenser….which was perfect for her. We filled it with personalized M&Ms several years later to celebrate her citizenship ceremony.) So this boat trip around the harbor was of particular interest to her. And she was all over that boat. While I found a spot on a cushioned bench outside to enjoy the ride, she was inside, outside, on top, buying candy, looking for the bathroom, checking out the window seats, etc. After being confined to the bus all day she definitely needed to move. She would come around once in a while to ask if I was cold (which I was), or to ask if I planned to go inside (which I didn’t). Finally I told her that I had waited my entire life for this and I wasn’t going to miss it. And that I was flipping freezing but didn’t trust my balance on the boat. She just grinned, did a little half turn and said, ‘OOoooOOOooohhh.’ She whipped out her cell phone and started snapping pictures. The ferry turned…..and there it was. You can read about it. You can see pictures in books and magazines and newspapers and movies from every possible angle but there is nothing….and I mean NOTHING….like actually seeing the Statue of Liberty in person. It was like a heart stopping thrill for my Princess and I. 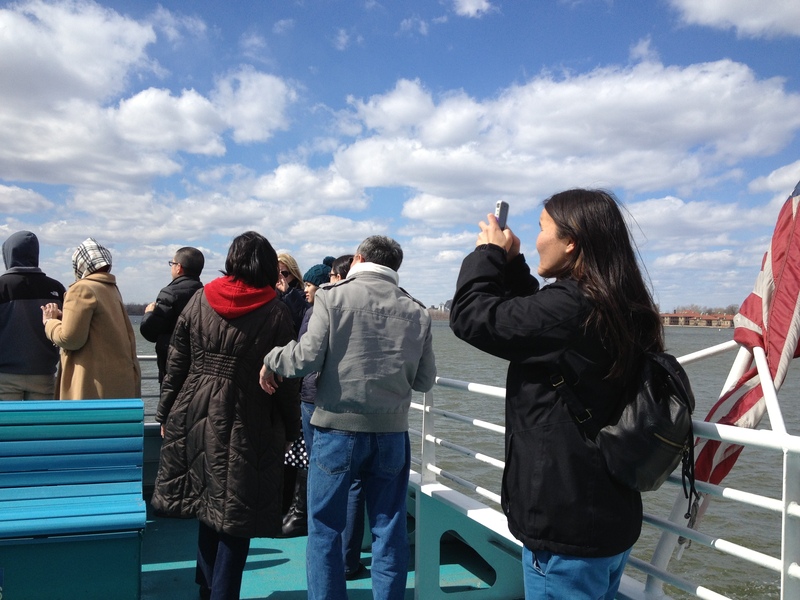 And we did the tourist thing with our cell phone cameras, taking pictures from every possible angle the ferry afforded us. This is my favorite. While there were other things ahead of us on this NYC adventure, I think the moment she first saw The Lady….the ‘OoooOOOOooohhhh’ just before she whipped out her cell phone to take pictures….will be the one moment that made all of the planning and the worries and the expense for this adventure….worth it. She had a smile on her face for the rest of the tour that day. We passed things that were familiar to her. The Twin Towers Memorial (which she did not want to visit) and the Wall Street bull (which we had seen in the movies) were among them. Our tour ended at Rockefeller Plaza and we had dinner reservations to get to. We high tailed it out of there. 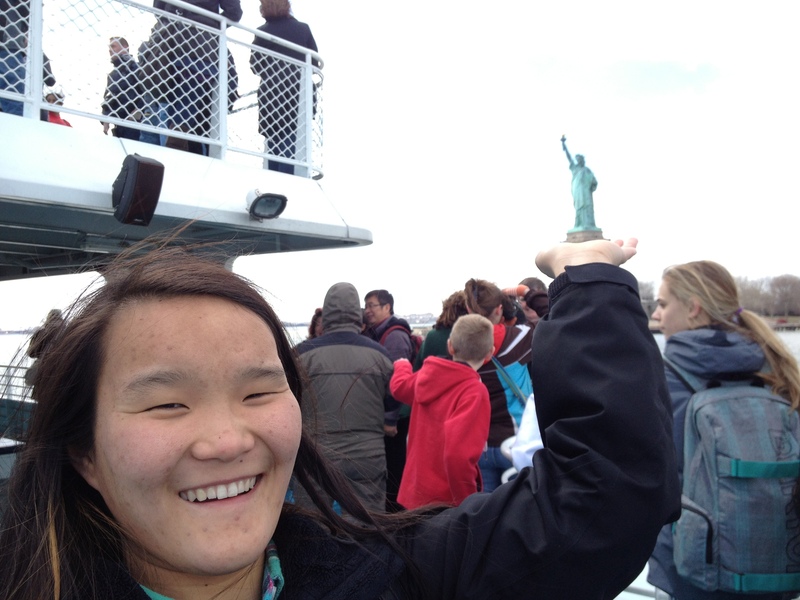 And she was still smiling and still talking about that ferry trip around the Statue of Liberty. This entry was posted on November 7, 2013 at 12:49 pm and is filed under Uncategorized. You can subscribe via RSS 2.0 feed to this post's comments. You can comment below, or link to this permanent URL from your own site.